I GENERALLY TRY TO PLAY A HOLE in the way that makes the most sense to my game. I'm more likely to lay up than try the heroic shot because the long run payoff is higher for me, even if the short run thrill is lower. 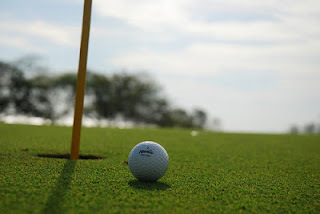 I'll try to hit the fairway rather than cut distance off in the rough because I feel better about a long shot with a predictable lie. But I think I've finally found the hole where my rules don’t apply. The 5th hole on my regular course is a 378-yard dogleg left par 4. Trees line the narrow fairway down to the dogleg. Hit the perfect drive down the middle to the center of the dogleg and you have a 100 yard or so wedge into the green. Hit it a little too far, and you catch a fairway bunker. A little too short, and trees block your shot to the green. You can hit it over the trees if you are in the perfect spot, but it's a very small spot. There are also a few places in the fairway you can hit short of the dogleg and then hit a short iron through gaps in the trees, but these are also small spots. For years I tried to hit the fairway. Sometimes I had a shot to the green, but I hit a lot of trees, occasional out-of-bounds shots, and many good drives that gave me no shot. I tried irons to safe spots, but the fairway slopes and doesn't hold predictably enough for the ball to stop at a predictable distance, so irons were a crap shoot. I now just bang the ball as far as I can over the trees on the left and down the waste area. If I miss the bushes, I have a little punch and roll shot into the green. My scores have been much better on average. I never go out of bounds, and an unplayable drop from a bush still gives me a chance at a par putt after a decent approach shot. I have no idea. I guess I'll keep trying to play my version of smart, but stay ready to welcome flashes of stupidity.